The source code below provides valuable insight into what it takes to code a successful Atari 2600 homebrew game. The current source compiles to both NTSC and PAL with a compile switch, and the PAL version can be toggled between 50hz and 60hz mode on the fly using the right difficulty switch. We thank Fabrizio for making this source available so others may benefit from his experience. 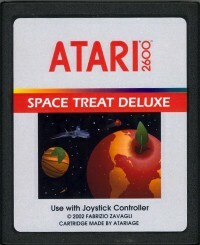 Please visit Fabrizio Zavagli's homepage at www.rasty.com to learn more about Rasty's Atari and other projects.